In the village of Lauscha in Germany, things have been done the same way for centuries. The men blow the glass, and the women decorate and pack it. But when Joost Steinmann passes away unexpectedly one September night, his three daughters must learn to fend for themselves. While feisty Johanna takes a practical approach to looking for work, Ruth follows her heart, aiming to catch the eye of a handsome young villager. But it is dreamy, quiet Marie who has always been the most captivated by the magic—and sparkling possibilities—of the craft of glassblowing. 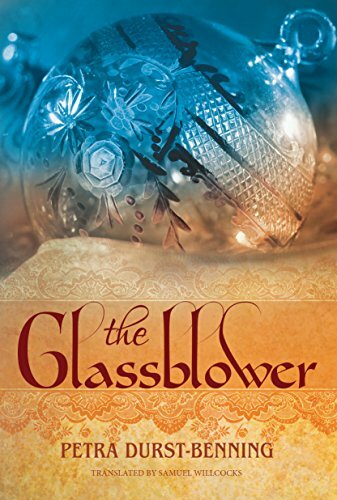 As the spirited sisters work together to forge a brighter future for themselves on their own terms, they learn not only how to thrive in a man’s world, but how to remain true to themselves—and their hearts—in the process.The Glassblower by Petra Durst-Benning is the first book in The Glassblower Trilogy and was originally published in 2003 in German. This astounding work of cultural and historical romance is beautifully rendered into English by Samuel Willcocks, and the novel will be of immense delight to anyone with a bit of interest in German history and culture. There is much more than I anticipated in the book. Apart from the joy of reading it, the book leaves a comforting feeling that everyone can be happy in his own way, if one is brave enough to set one’s priorities right. In the book author Petra Durst-Benning tells the story of the three young Steinmann sisters who live in the glassblowing village of Lauscha in Germany at the end of the nineteenth century and early years of the twentieth century. Johanna, Ruth and Marie must look after themselves when their father Joost Steinmann passes away unexpectedly one September night. But making a livelihood in the village is easier said than done as glassblowing is a male-dominated craft. The Steinmann sisters are so well-conceived and developed that their characters are so lifelike and believable. As you leaf through the pages, you will laugh and cry with them, and at times feel the need to reprove them. Beautifully written and well-researched, Petra Durst-Benning painted a sweeping portrait of the fascinating characters that populated the book as well as the profession which they are involved in. The Glassblower is a fascinating lesson in German culture and history, and without ever exceeding the limit of credibility, the author brilliantly crafted a powerful story of women’s emancipation, the ideals and aspiration that is burning within each individual even within the confines of a hopeless situation and how one can be happy and content in one’s condition if one’s heart is in it.